TGIF! I have not much time being summer and family gatherings to feed my shallow drama addiction (not that anything is worthy), that and my folk s wide-eyed fascination of the fugly political circus going on live on TV nightly…I need a dire break. 5 2 0, I love you in Mandarin shorthand. Yes, Love is in the air alright. Well. From now on I’ll hold up a YH post till I can tease some juicy updates. Back to my favorite past time. Yes, I might as well relocate to Elephant Mountain. 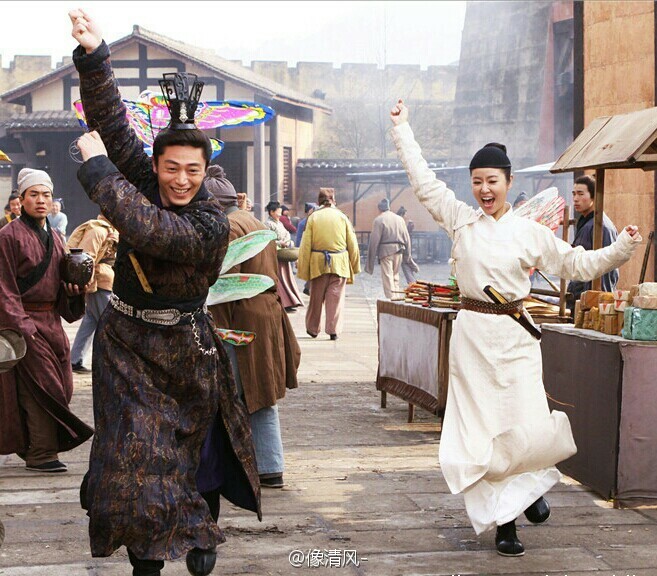 Don’t worry if you are getting sick of my Chang!Ge!Xing-ing!, primary filming is rounding up this week or so. Try as I might, I just have to picspam. This has surpassed my expectation every step of the way from what has been leaking out and this is now my most anticipated 2014 drama (not just Cdrama). Last day of September, so long summer! This post will be a monsoon of pretty men (ie not just Loverboy) and ladies in period costumes, a lot of Loverboy kissing (a girl, not the pretty men), HuGe (and their lovechild jkjk) and a fanboy’s sweet fanletter to MaestroMiyazaki. I hope these scripts are decent, because there is no way I can peel my eyes off. I’m not greedy, nor being impossible. I am not asking for the writing to be superb, because as the Cdrama productions have been hammering in the point, they won’t bother when they have these peeps (some uber A-listers) sashaying and would be making $$$$$$$ out of it anyway. Making a lot of business sense, they are. These are what I call some truly gorgeous actors with serviceable to OOHLALA talent gracing my screen. Interest is very piqued. Very.